Companies will schedule brainstorm meetings, and most will leave with a strong list of ways to improve marketing efforts – but fall short on the follow through. This isn’t for lack of trying! It can be discouraging to try something new and find it didn’t work as well as you had hoped. Another common pitfall to consistent marketing is knowing what it is you need to do to elevate your marketing to get better results but finding it too challenging to maintain. 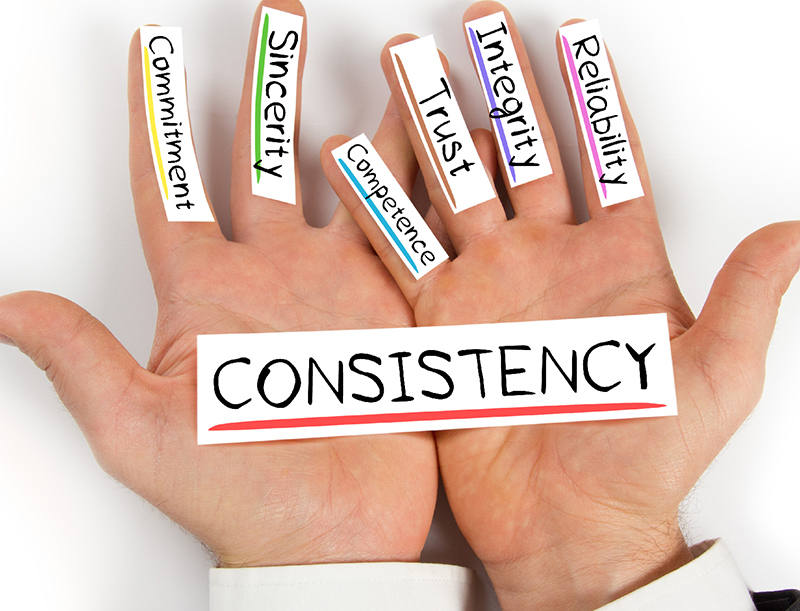 Read on to learn why consistency is essential in your marketing, which areas of your marketing to focus on, and how to maintain consistent marketing for your business! Constant marketing affects us in ways we may not readily identify. A recent Forbes article found reliable marketing “creates a pattern everyone can come to expect, and they develop a subconscious comfort level when you meet their business needs.” Essentially, placing importance upon being consistent in marketing creates a reliable and authoritative presence for your brand. Additionally, implementing your marketing strategy consistently enables you to monitor and accurately assess your progress. By utilizing data and factual statistics about conversion rates, you can continue to improve your strategy and make strides toward scaling your business. It stands to reason that businesses who regularly have positive feedback in conversions and lead generation have consistent marketing and a clear message over a considerable period. A great place to start creating consistent marketing is to get your team on board. By openly communicating your intentions to your employees, your team will become unified and proactive about your marketing vision and goals. Once you have established your goals, begin to consider the best practices for communicating your brand’s message. Post regularly on several social media platforms. Social management tools like Hootsuite enable you to manage multiple social networks from a single hub. Additionally, you can measure and track your social media campaigns and ROI with free-to-use tools. Creating high-quality content that gets quoted, backlinked, and shared on social media. This encourages Google to identify your website as a relevant and authoritative source. It also establishes your business as a quality resource and builds trust and visibility for your brand. Your consistent marketing of valuable content will lead to increased opt-ins to your e-mail, newsletter, or warm leads lists. When you send an e-mail to a contact that has previously shown interest in your brand, it is effortless marketing that reaches exactly the customer you are seeking. Consider e-mail marketing platforms like MailChimp to create unique campaigns, automate your work, and optimize your effort. As you continue to expand your potential customers through creating quality content, consider outsourcing certain aspects of your marketing. For many companies, outsourcing things like direct mail projects allows ample time to focus on creating content while specialized marketing agencies focus on promoting larger initiatives. Advanced outreach such as this enables your in-house marketing team to focus on daily consistent marketing tasks. You, in turn, can benefit from specialists creating and monitoring your more advanced marketing strategies. By delivering a clear and consistent message, your brand will stay on the top of your client’s mind. In establishing your business as an industry leader and credible resource in solving problems, you become the brand they turn to when they need your service or product. Now is the time to get clear on your brand’s message and spread the word about how you can share value with your customers! For more information about best practices and more ways to stay consistent in your marketing, feel free to reach out to us! Check out our other blogs for additional ideas to boost your marketing and revenue.